A major societal concern with iodine deficiency is the negative impact on neurocognition in affected children. Therefore, it should be a priority to provide sufficient iodine to the next generation and ensure sufficient iodine supply. According to the WHO an effective European monitoring programme is a crucial step towards eradication of IDD with significant benefits for European citizens and the sustainability of health-care systems. 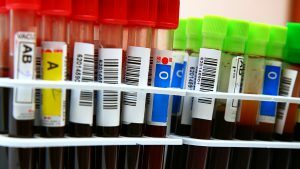 Towards ensuring the availability of cost-effective screening, EUthyroid has developed a simple assay of Thyroglobulin using dried blood spot (DBS) to analyse samples collected from various IDD monitoring studies across Europe. Additionally, a study has been conducted and finalised to assess intra-individual variation and variation between the analysis methods. To study the health outcomes of low maternal iodine, in particular on child neurodevelopment, data from population studies in the Netherlands, UK and Spain have been harmonised and integrated into one large dataset. A proof-of-principle study has already been performed on the effects of thyroid function on child IQ and the risk of behavioural disorders in over 9,500 mothers and their children. Results showed that optimal maternal thyroid hormone levels during early pregnancy are associated with a higher IQ and a higher risk of autism in children compared to mothers with mild iodine deficiency or excess.